At Larson Waste, we take pride in delivering prompt and courteous service. If you have any questions or concerns regarding your account, please contact our customer service department. GET A ROLL-OFF DELIVERED TO YOUR PROJECT! When calling to request that your container be emptied please specify if you are finished with it or if you are requesting a pull & return. When requesting a pull, please give your company name, a contact name and number, and the location of the container (address or lot number). For next day service you must call in your pull request before 2:00 pm, pull requests received after 2:00 pm cannot be guaranteed next day service. Next day service is dependent upon the availability of trucks and drivers. Containers that have not been pulled within 30 days of the delivery date or the last pull date will be assessed a $5.00 per day setting fee. If the driver arrives and is unable to pull the container because it is obstructed or the material has been loaded into the container in such a way that the container cannot be covered and transported safely, the customer will be assessed a $100.00 dry run fee. 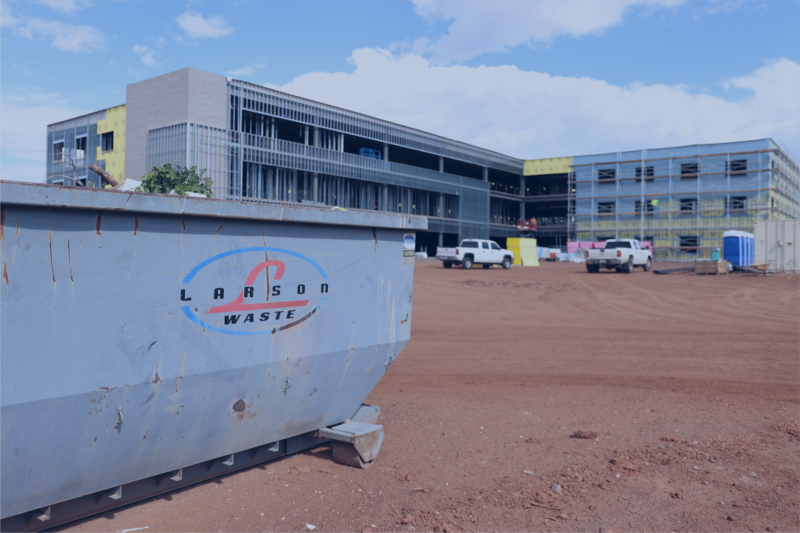 PLEASE DO NOT place these materials in your Larson Waste container: Tires, batteries, hazardous waste or toxic materials such as: paint, stains, paint thinner, oil, flammable or explosive materials, or dead animals. Refrigerators or freezers must have a certification stating that the Freon has been evacuated before the unit can be disposed of. There will be a $200.00 surcharge assessed anytime the container weight exceeds 10 tons. Do not attempt to move containers with on site equipment, or use on site equipment to push material up against the container when loading. Do not over fill and compress so hard that it bulges the roll off out damaging the roll off. The customer will be held liable for any damage that occurs to any container while on the job site due to these acts. When requesting a pull, please make sure that there are no materials, vehicles, or equipment blocking the container. There cannot be any material sticking above or hanging over the side of the container, all material must be safely contained within the container so that the container can be covered with a tarp for transport. Any request to re-spot or re-locate a container without tipping (emptying) it, will result in a $50.00 Re-spot fee. We'll respond to your request within 2 business days.